Eastern Orthodoxy is the third largest branch of Christianity after Catholicism and Protestantism, yet it is a branch that many of the people in Western European countries know nothing about. This remains unchanged even after the entrance of countries with a large Orthodox population into the European Union. 8% of the population of European Union, consider themselves Eastern Orthodox, which is twice as many as there are Muslims. The 2001 census showed that 94.9% of ethnic Bulgarians consider themselves Orthodox, and according to some scholars, 85% of Bulgarians view the Bulgarian Orthodox Church as a “cultural liberator and spiritual saviour of the nation”. How vital was the involvement of the Church for the reestablishment of Bulgarian national identity is still being debated, but it certainly played a big factor. 865 A.D is accepted as the date of the baptism of the Bulgarian Khan Boris and consequently the date of the baptism of Bulgaria. It is considerably early in comparison to the rest of Europe. Bulgaria was observed by three different Christian centres; Constantinople, Rome and the kingdom of the East Franks. These three influences gave the Bulgarian Orthodox Church its independent nature. The decision of Boris to adopt Christianity arose from the need to unify the population under a common institution, as well as his ambition for Bulgaria to be taken more seriously on the international arena. This however eventually led to a greater involvement of great powers in Bulgaria. In 1396, the Bulgarian Empire collapsed after the attack from the Ottoman Empire, followed by 500 years under their foreign rule. Bulgaria’s economic and political development was halted, and her cultural heritage put at risk due to the destruction of Churches and many written materials. The Ottoman Muslims are remembered as being exceptionally violent, carrying out genocides and persecuting Christians, who at large were considered below them in the social hierarchy. However, Muslim communities still remember them as an embodiment of culture. Even though it was claimed that the Ottomans did not require Christians to convert to Islam, forced Islamisation took place in both more and less direct ways. An example of this was what became known as ‘child tax’ or ‘blood tax’, where boys aged 7-14 were taken from Christian families and were forced to convert to Islam, in order to later fight in the corps of the Sultan. The Bulgarian Orthodox Church did played a role in active resistance against the Ottomans, as well as in preserving the Bulgarian language and culture. Monasteries and churches became places of refuge for groups of Hajduks, who were outlaws engaged in armed resistance against the Turks. There are also instances of Orthodox priests, leading such groups of as many as 100 men. Possibly the most important input of the Bulgarian Orthodox Church was the creation of church cell schools, which emerged in the second half of the 15th century. Classes took place in monasteries and convents , and it was the only education available to Bulgarian Christians. Many scholars agree that even though the quality of education was low, these schools managed to form the basis needed for the economic, political and cultural revival in Bulgaria. In 1762, Father Paisii of Hilendor wrote the iconic Slavonic-Bulgarian History. There he described history of the great Bulgaria, mentioning place names, making Bulgaria seem like a geographical entity once again. More importantly, he urged Bulgarians to celebrate their culture and history, and to be proud of who they are, leading to the strengthening of ideas of a free, autonomous state. As at that time the Bulgarian identity was closely linked to Orthodoxy, in opposition to Turkish Muslims, the Rila Monastery became an important place to celebrate nationality and religion. It showed that Bulgarians managed to uphold their own identity despite the Ottoman and Greek influences. 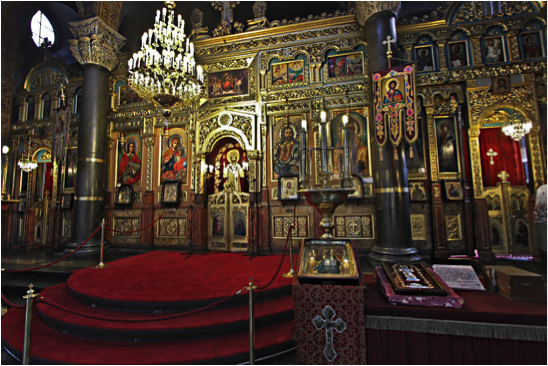 Bulgarian Orthodox Churches are often very richly decorated, with gold elements and painted icons. Icons are sacred paintings, which are one of the central elements of Orthodoxy and one of the main differences between Orthodoxy and other branches of Christianity. 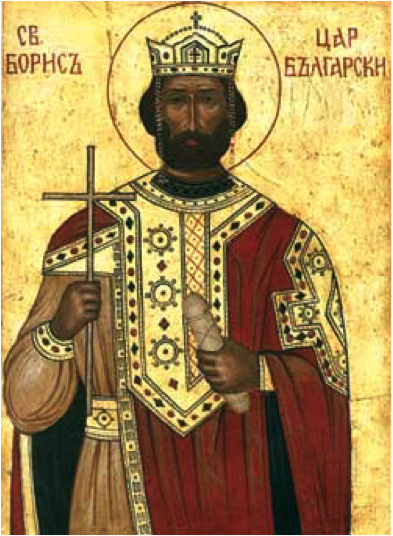 In Bulgaria, the name day is also celebrated, which would be the day of the saint you were named after. 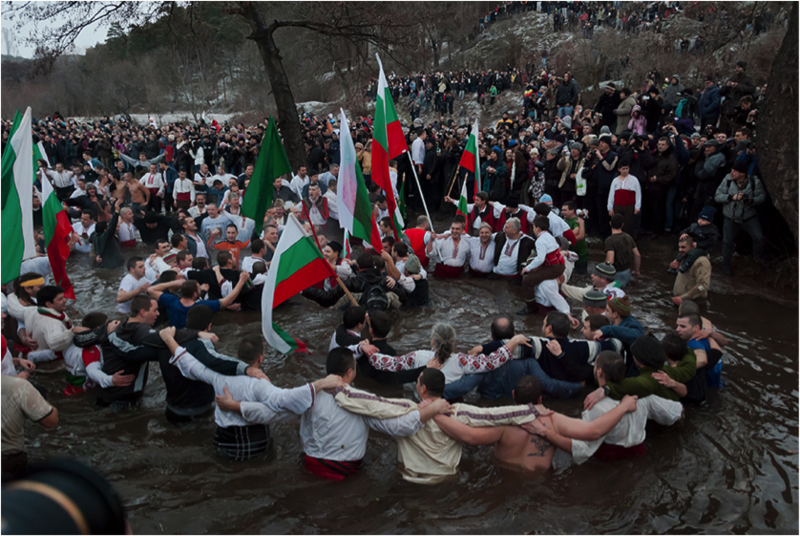 A popular religious celebration is the Epiphany, on January 6th. According to the Orthodox calendar, this was the day that Jesus was baptised in the river Jordan. Traditionally, after the church service, the priest throws a cross into a frozen river. The bachelors from the town or village, jump after it into the water, and he who retrieves it is believed to have health and happiness. Additionally, if the cross freezes over before it is taken out, that means that the year will be healthy and fruitful. Bulgaria is a country of many traditions and an extensive and dramatic history, even a fraction of which would be impossible to mention in one blog post, which many people do not know about. It should be in our interest to educate ourselves about the culture of the people who we see on daily basis.